Lily is a long time advocate for the rights of children and adults with disabilities. She is a registered nurse (B.S.N.) and obtained her Masters of Science in Special Education (M.S.Ed.) from the University of Miami. She has extensive training in the field of mental health, disabilities, and advocacy. She joined Parent to Parent of Miami in 2001 and held the position of Training Director until 2006. In 2008 she served on the Board of Trustees and served as President until 2013. She was Director and Founder of JAG Education Consultants, Inc. She held consultant positions with Florida International University, University of Miami School of Law, and other community agencies. She founded Project Panther LIFE: Learning is for Everyone, a college transition program for students with Intellectual Disabilities at Florida International University in Miami. Governor Rick Scott appointed Lily to The Children’s Trust Board in 2011. She is currently the Chair of the Program Services/Childhood Health Committee and the Vice-Chair of The Board of Directors. She served on Florida International University’s College of Education Dean’s Advisory Council, the State Advisory Committee for the Education of Exceptional Students, the University of Miami Mailman Center for Child Development Advisory Committee, the Florida International University Special Education Advisory Board, and the State Secondary Transition Interagency Council. Mrs. de Moya has always been a fierce advocate for the rights of children with disabilities and their families. She was awarded the “Henry Bandier C.A.M.P for Justice Fellowship” by the University of Miami Children’s Youth and Law Clinic for her work with children and young adults in foster care with disabilities. She is the mother of two grandchildren and two sons, the youngest having an intellectual disability. Sofia was born in Buenos Aires, Argentina and has two sons. She has a BS in Journalism and International Studies from the University of Miami and an MBA with a specialization in HealthCare from Florida International University. She currently works in the healthcare industry. Stefanie is a lawyer at Littler Mendelson, PC, dedicated to representing management in employment and labor law matters. She and her husband, Tony, have two children, Serafina (5 years) and Alessia (2 years). Currently, Tony is in the process of launching a new tech startup, Carepass, to connect parents with on-demand care at licensed childcare centers. Stefanie currently is on the Advisory Board for the De Moya Foundation, for which she has served as Advisory Legal Counsel for the past three years. Stefanie also is currently the Treasurer of Young Patronesses of the Opera, for which she previously served as Financial Secretary. Stefanie is a sustaining member of Junior League of Miami, for which she served as Chair of the Communications Council for several years and once served as co-chair of the auction for the Women Who Make a Difference Luncheon. Dr. Michael Alessandri is the Executive Director of the University of Miami Center for Autism and Related Disabilities (CARD). Dr. Alessandri is also Assistant Chairman of the Department of Psychology and Clinical Professor of Psychology and Pediatrics. Dr. Alessandri has been with the University of Miami for nearly 20 years and has worked with individuals with autism and their families for over 30 years. Dr. Alessandri is a Phi Beta Kappa graduate of the University of Rochester, where he earned his Bachelor’s degree in Psychology. He attended graduate school at Rutgers University, where he obtained both his M.S. (1989) and Ph.D. (1992) in Clinical Psychology. Dr. Alessandri completed his clinical internship at UNC-Chapel Hill’s Center for Development and Learning (CDL). Prior to arriving in South Florida in 1996, Dr. Alessandri was an Assistant Professor of Psychology at San Jose State University (SJSU) and Associate Director of the Stanford University Pervasive Developmental Disorders Clinic. Dr. Alessandri has presented, consulted and published internationally on developing appropriate and effective educational programs for students with autism spectrum disorders. In addition, he has received numerous research and service grants and several notable awards within the field including the Autism Society of America (ASA) Special Recognition Award for Publications (1993), the Outstanding Faculty award by the SJSU Disability Resource Center (1995), and the ASA’s Wendy F. Miller Autism Professional of the Year Award (2003). Under his direction, the University of Miami Center for Autism & Related Disabilities was named ASA’s National Autism Program of the Year in 1999. Dr. Alessandri has also received numerous other community service awards, including the March of Dimes Community Excellence in Health Care Award (2007), the Health Services Coalition Outstanding Community Leader Award (2009), and the Parent to Parent Excellence in Family Advocacy Award (2010). He was also named one of the Ronald McDonald House’s 12 Good Men (2008) and the Dewar’s 12 Man of Distinction (2007). In 2012, he was selected by the Children’s Trust as the David Lawrence Champion for Children, one of South Florida’s highest honors for community service. Alex de Moya works full time at The de Moya Group where he is his supervisor’s helper along with another assistant. He plays flag football and goes to UM games in his free time. He helps the Foundation by fundraising and helping to plan events. Joni Jones Harris is a fierce advocate for children and adults with disabilities in Miami-Dade County. 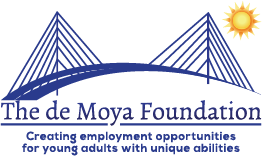 Her commitment and dedication to our community is evident in the time and passion she dedicates both professionally and personally as one of the founding advisory board members of The de Moya Foundation. Her experiences through her life long journey with human resources and disabilities have proved to be an invaluable asset to the mission of the Foundation. Joni joined the board in March 2015 and serves in the Grant Proposal and Employment Groups. I was born in Havana, Cuba and my story is much the same as that of most who came to this country seeking freedom. My parents left Cuba when I was 9 years old. After a short layover in Spain, we were welcomed into our new country: the Good Old USA! I am so thankful to this country for opening its arms to us and providing my parents with the opportunity to start a new life. Always Cuban at heart but so proud to be an American! We joined my father’s family in a little town called Weehawken in the state of New Jersey where I experienced my teenage years and married my high school sweetheart, Osvaldo (affectionately called Ozzie by his friends which was easier to pronounce in a predominantly Anglo town than the real thing). We have been married for over 40 years! In 1976 Ozzie and I decided to make a move to Miami in search of much warmer weather and partake of our much-missed Cuban culture. In 1979 we were blessed with the arrival of our first child, Alex, followed by Michael 5 years later. Alex and Michael are happily married and I have five wonderful grandchildren: Sofia, Nico, Adrian, Anthony, and Andrew. I work as Marketing Manager for a global wine company (not too shabby). I dedicate much of my free time enjoying time with my hubby, spoiling my grandkids, having fun with my Lhasa Apso, Lily, and my Yorkie, Pixie, and sharing fun times with very good friends. Mr. Monnar holds a Bachelor of Science degree in Specific Learning Disabilities as well as an Educational Specialist degree in School Psychology. He is the president of One on One Learning and has been a leader in individualized education for over 17 years. Mr. Monnar has extensive experience in working with students of all ages and abilities, parents and administrators; he has worked with schools and school districts across the nation providing academic, professional and parental services face-to-face and online. Dr. Paula Petry has a unique blending of life experiences, academic knowledge, and intuitive gifts. She has her doctoral degree in special education from the University of Miami where she also was on faculty in its school of medicine. There she directed an interdisciplinary training program at the Mailman Center for Child Development, preparing future practitioners to work effectively with children with special health care needs and their families. Paula is the founder and honorary advisor of Parent to Parent of Miami, a non-profit that provides support, information, and advocacy to families who have a child with a disability. She attended Harvard’s Executive Leadership program and developed leadership programs for students and parents. Most recently, Paula has been certified as a Light Body Practitioner through the Four Winds Society and studied arts in medicine at the University of Florida, Shands Hospital. She is the creator of a mind, body, spirit movement program for youth, Moved to Learn, and the Discover From Within Workshop Series for Women. Her programs undergo rigorous evaluation and have been shown to be very effective in promoting well-being. Kirsten Schwarz Olmedo is the Director of Design Therapy of Miami, she was born and raised in Miami, FL and earned her Bachelor of Arts in Speech-Language Pathology and Audiology from the University of Florida. She went on to earn her Master of Science Degree from Nova Southeastern University where she is currently completing her doctoral degree in education with a major in speech-language pathology. Her current research focuses on the language-literacy connection. Kirsten has also worked with Miami-Dade County Public Schools for over 14 years servicing elementary, middle, and high school students. Kirsten is fluent in American Sign Language, serves as a faculty member at the University of Miami, within the College of Education, and also provides baby sign language workshops for parents and families. Kirsten has always strived to stay up-to-date on the latest research and evidence-based practices. In 2001, Kirsten earned her National Board Teaching Certificate as an Exceptional Needs Specialist, focusing on students who are Deaf/Hard of Hearing. Kirsten truly loves working with her clients and their families as well as providing local, state, and national trainings for educators, other team members, and families to further enhance early intervention and appropriate referrals as well as increase the carryover of skills learned in therapy. Lola Solis is a real estate professional having owned a real estate company for 15 years. She is dedicated and organized with a strong work ethic and now manages apartments in the Tampa area. Having been touched by a family member with learning disabilities has made her more compassionate and empathetic with the desire to reach out and advocate for those with special and unique abilities. Carlos Manuel Valdes grew up in Havana, Cuba. Arrived in the United States in 1981 at the age of fifteen. He is a technologist and a social entrepreneur. Has founded three successful companies, all working in some fashion to eradicate the digital divide in America. Carlos started his technology career at the Miami Herald in 1987. He grew from programmer to manager of systems support. While at the Herald, Carlos founded Zipdata.net, a twenty four year old technology and support company in Miami, Florida. He provides strategy consulting and technology investment advice to major non-profits in Florida. Working with the Health Foundation of South Florida, has served as a technology rider for non-profits organizations. He improved their technological capabilities with grants from the Foundation. Carlos is also the CEO of Bluejeanware, a software development company with clients like the Knight Foundation and the Epilepsy Foundation of Florida. Bluejeanware employs many recent immigrants as software developers. One of Carlos’ great accomplishments is to help bridge the cultural gap for these individuals in the American economic landscape. He has many stories of immigrants embracing their own American dream. Carlos co-authored the WELS System. A web software that measures the quality of child care facilities and helps improve it. The software makes education in child care measurable and accountable. WELS works with the ELC, the children’s trust, the University of Washington State, City University of New York, Florida International University, University of New Mexico, and others to improve the quality of subsidized childcare for all. Carlos is a past board member of the WOW Center in Miami. He is currently a member of the Cuban studies group for Harvard University. For fun, Carlos enjoys sailing on Biscayne Bay, he is an avid barbecue connoisseur, and a software developer at night. He has five children and wishes they did not play so many video games. He predicts that in the future, machines will build things, not humans. And programmers will be in high demand. Alvaro de Moya is the Vice President and General Superintendent for The de Moya Group with over 30 years of experience in highway and bridge construction. As a business owner and a father of an adult with a disability, he understands the importance of building independence and is fully committed to creating employment for young adults with disabilities. Christina Perez Abrams is a retired executive who previously worked in government and non-profit organizations. Positions held include Director of Conferences, Conventions & Public Facilities, Executive Director Miami Sports & Exhibition Authority, Interim Director Bayfront Park Management Trust, Director Miami Downtown Hotel Association, Director Miami Waterfront Advisory Board, Board Member Greater Miami Convention & Visitor’s Bureau, Board Member West Grove Chamber of Commerce. Presently volunteering with a local food bank.